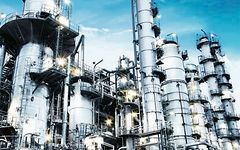 In onshore and offshore extraction, in refineries, intermediate storage and downstream applications – KSB products make sure our natural resources are processed safely and reliably. Optimum functioning and maximum reliability are crucial, not only to ensure smooth processes but also to protect people and the environment. To process crude oil safely and efficiently all components have to be absolutely reliable. KSB takes utmost care to meet this criterion, particularly when it comes to process pumps and valves used in refineries. Long service life and low maintenance with high operating reliability – these are the main requirements for hermetically sealed API pumps. With the market launch of the new RPHmdp API pump, KSB is now also offering this reliable and service-friendly product for processes in the refinery industry. 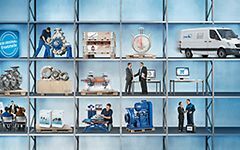 The robust single-stage process pumps of KSB’s RPH series reliably and efficiently handle fluids in refineries, petrochemical and chemical plants as well as in power stations. The multistage barrel-type CHTR pump runs reliably at high pressure and can thus sustain extremely demanding applications in the oil and gas industries. The canned motor pump to API 685 meets the toughest requirements in refineries and petrochemical applications. At the same time it is particularly easy to operate and provides maximum operating reliability. A new pump is not always required: With the RPC (Refinery Pump Cartridge) Retrofit Kit, KSB offers standardised upgrades for single-stage horizontal OH2 process pumps to API 610.